The Durban University of Technology won six Excellence Awards at the 2012 Marketing, Advancement and Communication in Education (MACE) Conference, held from 10 to 12 October 2012 in Cape Town. MACE unites marketing, advancement and communication practitioners from Higher Education (HE) and Further Education and Training (FET) sectors in South Africa. The conference promotes competence, networking and partnerships as well as advancement in marketing and communication departments within higher education. Alan Khan, Senior Director of Corporate Affairs at DUT attended the conference and awards ceremony. He was accompanied by four staff members within the Division together with Rowan Gatfield, who is a lecturer in the department of Visual Communication Design and the Creative Director of Workspace. DUT Vice-Chancellor and Principal, Professor Ahmed Bawa, on hearing of this “amazing” achievement paid tribute to the team. “They worked feverishly over the last year or so to make this an extraordinary achievement. This has been a memorable year in helping DUT to reposition itself as a university of choice for many thousands of young South Africans. As DUT embarks on a number of large transformatory projects, such as its Student-Centredness Project and it’s defining Curriculum Renewal Project, it does so in an integrated fashion. This is so exciting,” Prof Bawa said. The MACE Excellence Awards gives recognition to universities and colleges that set the tone in the field of marketing, communications and fundraising. The “Siyazama Project Magazine” won under External Publications and “The Edge,” a DUT magazine that will be launched soon, won under Internal Publications. The Department of Visual Communication Design’s BTech and MTech Sheet won under Special Publications. The fourth prize was awarded to the University in the form of a software development prize to the value of R25 000 – for the highest overall mark in this category. This was awarded for The Edge magazine design. In the Advertising category, the DUT Marketing Campaign won under Integrated Advertising Campaign while the Branding Award went to the DUT Invotech branding campaign. First picture: The Workspace team. 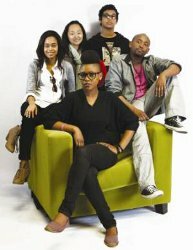 From left: Candy Belcher, Wendy Yang, Yoshen Nair, Agrippa Hlophe and S’ne Mthethwa.